Being fully formed in the Franciscan way of life is a multi-step process, one that lasts a lifetime! A commitment to this formation in every phase of life calls forth and strengthens our Christian and religious identity as Franciscan friars. The second stage of Franciscan formation is called novitiate. The novitiate is a year-long residential period in which a novice (meaning “beginner”) discerns his calling to religious life. He works to deepen his relationship with God and to develop his Franciscan identity by studying our Rule and General Constitutions, as well as the vows of poverty, chastity, and obedience. As a formal member of the Order, the novice receives the unique Franciscan garment, or the habit of the Order, which consists of a brown tunic and hood (or capuche), and a white cord which serves as a belt. Normally, the cord has three knots, symbolizing each of our religious vows: poverty, chastity, and obedience. But since the novice has not yet made that commitment, his cord is without knots. All of the novices of the Province of St. Barbara participate in the Franciscan Interprovincial Novitiate. It is presently located at Old Mission Santa Barbara, Santa Barbara, California. Novices come to live together from all seven OFM Provinces in the United States, as well as Christ the King Province in Western Canada, and the Provinces of Australia and Singapore. Upon successful completion of the novitiate year, novices conclude their year of probation by taking the vows of poverty, chastity, and obedience for a period of just one year. At this time they receive the three knots on their cord. The vows are then renewed yearly, until the friar is prepared to make his solemn, lifelong profession. This phase is called temporary profession. It is a period usually from a minimum of three to a maximum of nine years in which one integrates his Franciscan call into the consecrated life of the Order of Friars Minor. During the period of post-novitiate or temporary profession, friars further their ministerial and professional preparation and are educated according to their needs, gifts, and calling under the guidance of their directors. 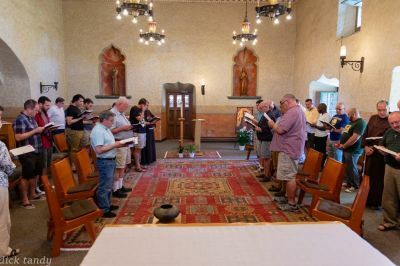 The usual course of theological training for friars of our province includes studies at the Franciscan School of Theology (www.fst.edu) in Oceanside, California. Many friars will also receive technical or occupational training in fields such as nursing, social work, or in a professional trade at an appropriate institution. Upon completion of post-novitiate formation (3 to 9 years), a friar in temporary profession, with approval from his directors and the local community, petitions the Provincial Minister to be received into solemn vows. If accepted, he publicly professes the vows of poverty, chastity, and obedience for the "rest of my life." This marks the beginning of full, lifelong membership in the Order of Friars Minor. Friars called to ordained ministry must be solemnly professed first. Formation as a Franciscan friar is the process of a lifetime. The period of formation following solemn vows – the life-long journey called “on-going formation” - is perhaps the most important period of a friar’s life. By living out the commitment they have made in a conscientious and responsible way through on-going formation, solemnly professed friars nurture the soil for future friars and strive to give good example in a full and ever-growing embrace of the Gospel life. Provincial retreats, fraternal gatherings, sabbaticals, and advanced studies are all a part of on-going formation. Most importantly, this formation happens within the context of day-to-day life in community and ministry where one is always learning and always being called and formed for an ever deeper relationship with God. "I want to be a new fool, the likes of which the world has never seen"